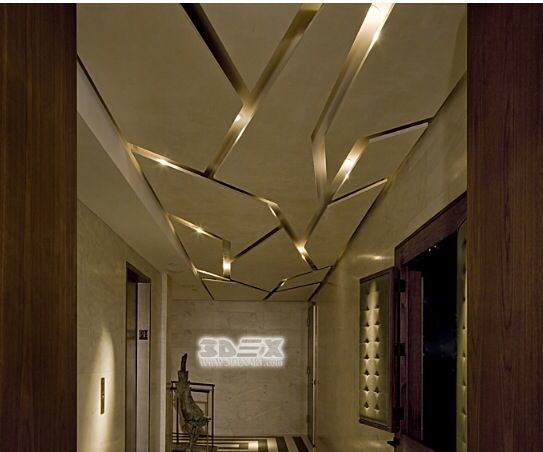 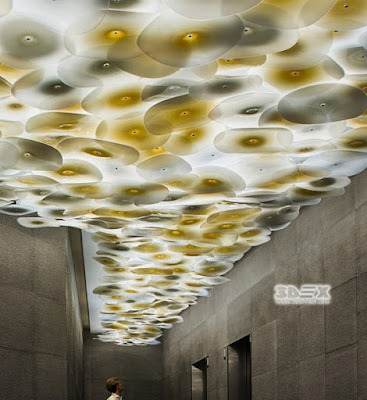 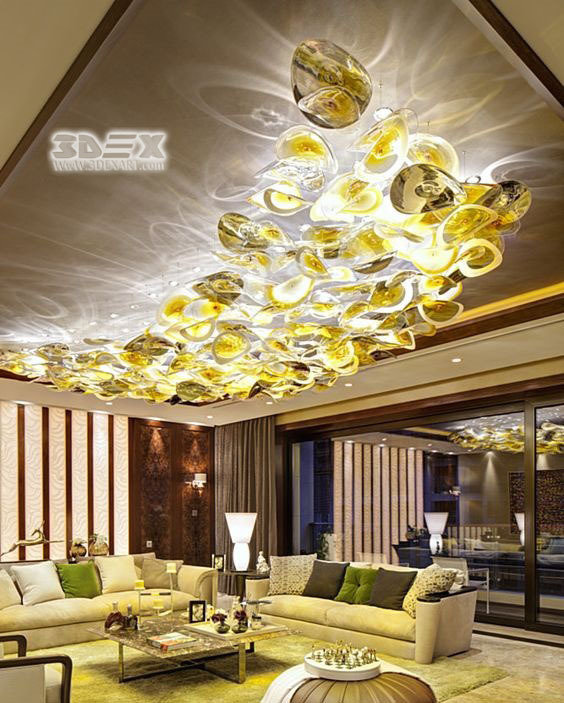 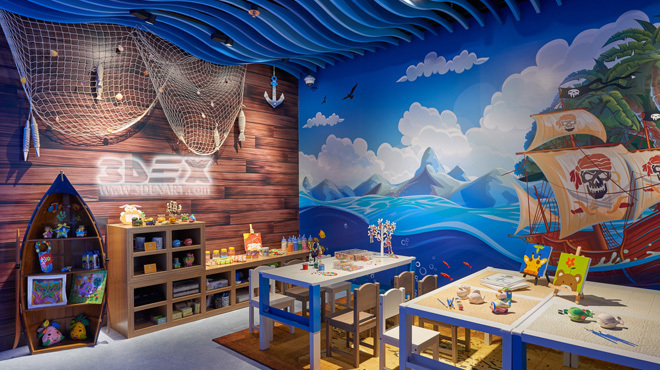 To paint the ceiling with solid with a solid color or to decorate it with traditional gypsum molds is from the past, ceiling and flooring are as important as the walls in any room, and as we're writing on the 3D flooring at 3Dex arts, its types, materials, and designs. now we present creative ideas to make a 3D ceiling design whatever is it a false ceiling design or a stretch ceiling, the designs and ideas fit into any room: living room, kids room, bedroom, and entrances. 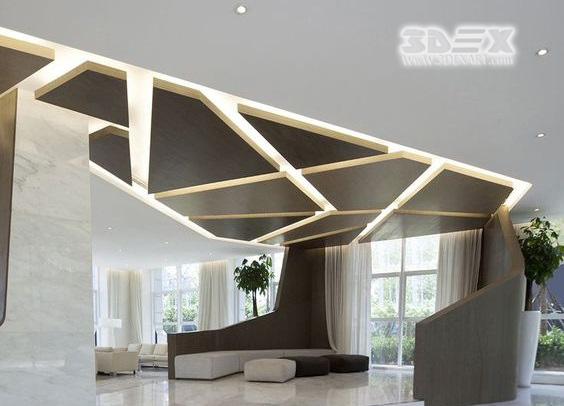 What is a 3D false ceiling? false ceiling is a ceiling that consists of two or more layers, the stretch ceiling, the drop ceiling of gypsum board, plasterboard or POP designs, The coffered wood ceiling and glass ceilings are all considered false ceilings, but we mean with "3D" that the ceiling has a design with optical illusion that gives the feeling and the view of three dimensions. 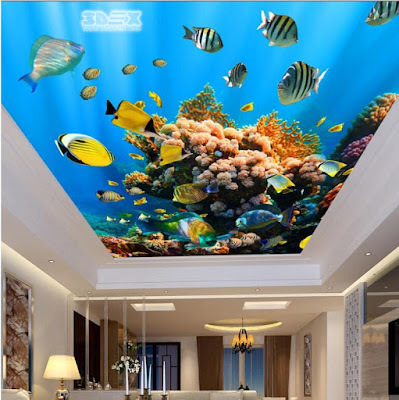 What can I do with 3D ceilings? for the first glance, you may think that 3D ceilings are a welfare or something like that, but there are many reasons why 3D false ceilings are necessary for the modern interior decoration and solving big problems with smart touches. 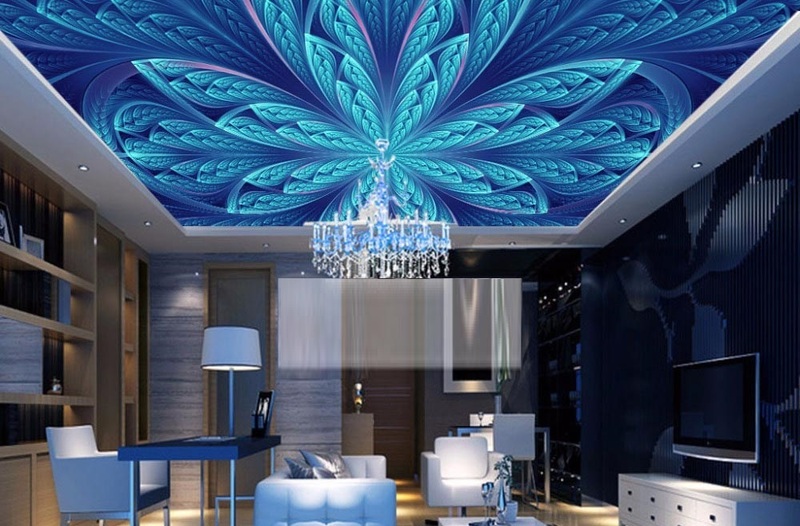 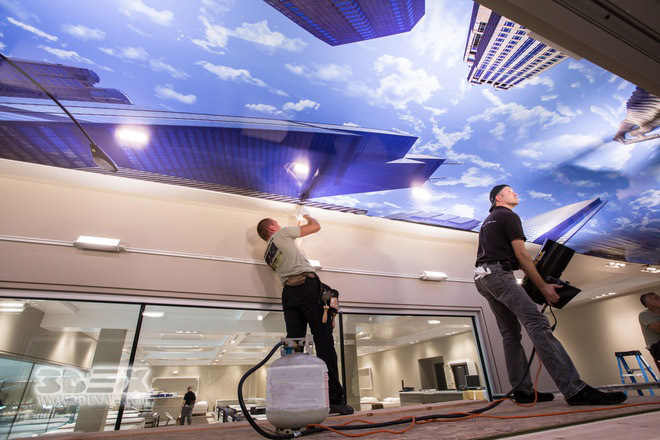 Of course, we all know that the false ceiling installation needs a high ceiling because it takes a large part from the wall to accommodate its layers, but with 3D ceiling effects and paintings, you can make it seems to be higher visually. 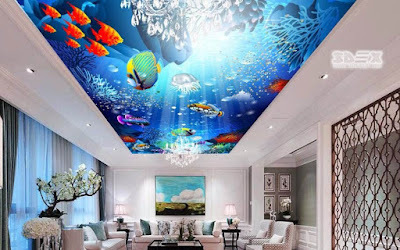 our kids always love to live in their fairy tales in their rooms, a lot of people still decorate their kid's room with a themed decor inspired by Disney movies, they decorate walls, floor, furniture with the theme colors and paintings, but make a solid ceiling as if it from another story! 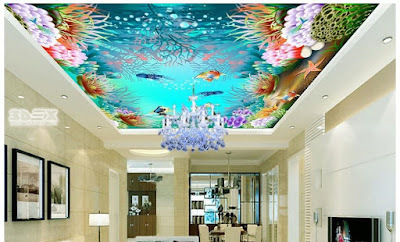 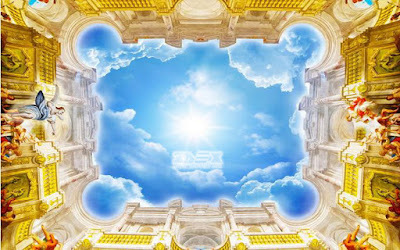 So, How to install a 3D ceiling design? 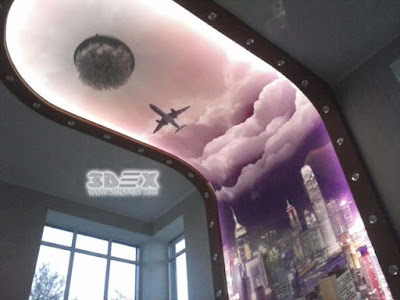 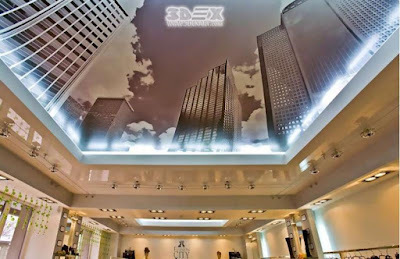 the easiest way to get a 3D ceiling in your home is to print a high-quality image on the base ceiling of your room. 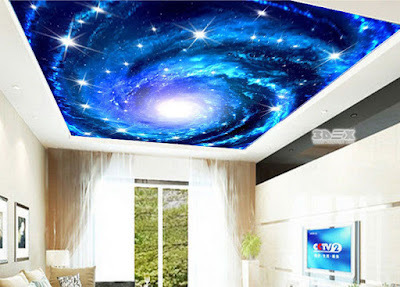 it is the cheapest way also. After installing the printed image with the epoxy material, you need to insulate it with transparent insulation and protecting materials, the transparent epoxy materials are available in shops from very low to very high quality and the cost varies also according to the quality. 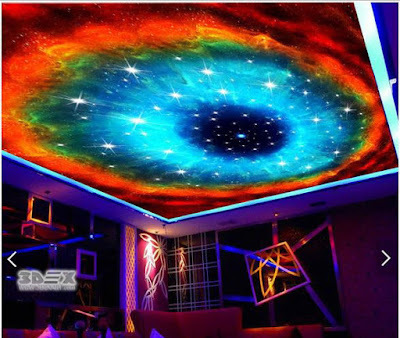 now we are in front of another type of 3D illusion, it is not photo printing or something like that, in this type of ceilings - gypsum board false ceiling designs - the design of the ceiling itself with the help of colors, paintings and lighting fixtures make a perfect 3D scene in the room, images below present creative ideas to make a 3D ceiling with gypsum board, lighting, and colors in any room or commercial place. 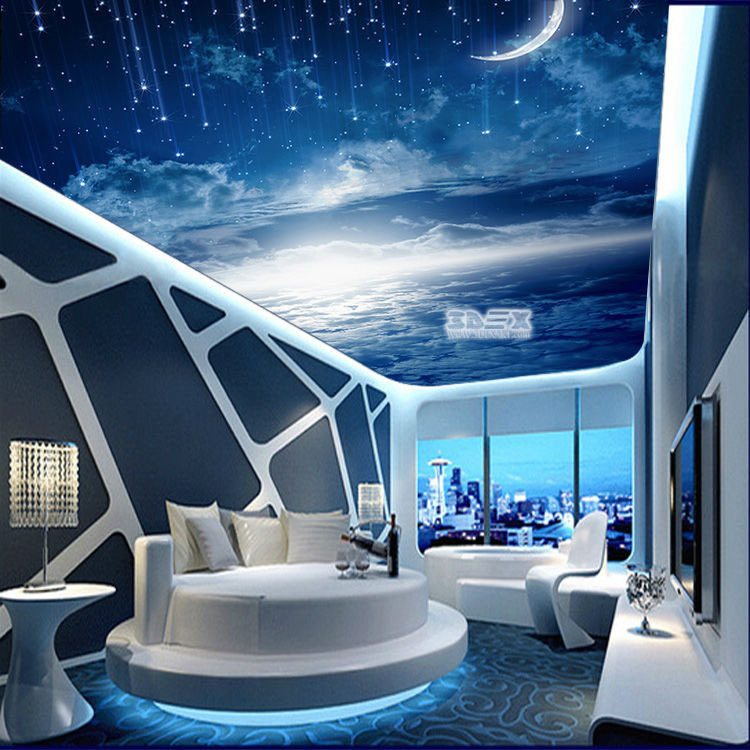 finally, share the best design in this article with your friends, and don't miss the first article on 3D ceilings with other creative ideas.